Ever wanted to learn more about the techniques you can do with Gesso? Check out this video by designer Tiffany Johnson! Hello Friends! alexandra here with a tutorial on how to make a multi-layered background using Faber-Castell's Glaze, Gesso, Gelatos and PITT Pastel Pencils (bleu/green). Featured today: AJ Otto! We love how she uses her white space with her clean simple designs- check out her other crafts here! If you can go anywhere in the world, where would you go? If I could go anywhere, it would be either Ireland or Italy. My favorite food- Mexican. Love it! What's your 'signature' crafting technique? My signature crafting style would have to be on the clean and simple side. sometimes graphic, but definitely less layers. I love white space. And finally...any words to our readers? I'm looking forward to being able to stretch and try new things out side of my comfort zone! Hiya! AJ again here to share another card using Faber-Castell Design Memory Craft® Gelatos® and Gesso. I saw an idea on pinterest a while ago using markers, and thought I could try the same with the Gelatos. Our featured designer today is Isha Gupta! I would like to go to Rome and Egypt. I love Chinese and Mexican vegetarian food. I love playing with colors using a variety of mediums. I tend to create clean and simple designs. Isha here, sharing my 3rd. post as Guest Designer at Faber-Castell Design Memory Craft®. Since it's summer vacation in two weeks, I decided to create actual post cards to send to friends. The scenes are inspired by the nature in Switzerland. Faber-Castell Design Memory Craft® products along with the wonderful Art Impression Stamps (watercolor line) and the Hero Arts post card stamp made a perfect combination for my project. I used the water color technique. The color code system by Faber-Castell Design Memory Craft® makes it easy to pick the right colors using various products. 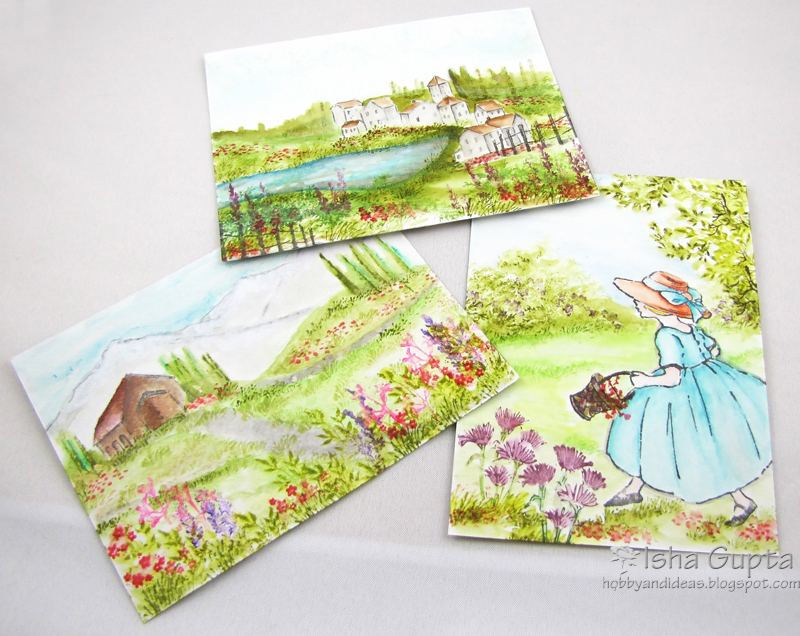 I created three post cards. On the front side, I created the water color scene using Art Impression stamps, and if you flip it, you'll see the stamped post card image by Hero Arts. Our featured designer today is Elena Olinevich! When we first saw Elena's stunning layouts, it was rather hard to describe it in one word. Yes, that's how beautiful her layouts are. Each layout has this wonderfuly sophitisticated aura about them that it takes a while to process them. 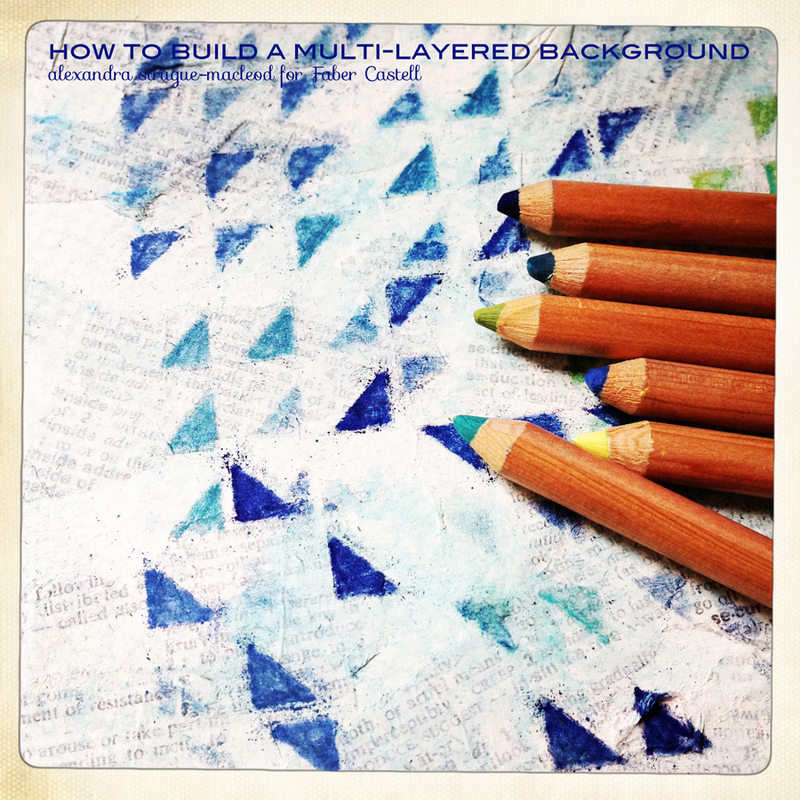 We encourage you to visit her blog to see her other wonderful layouts! It is so difficult to answer this question, as there is a plenty of places worth to visit and I am afraid my life will be too short to visit all of them. Hello everyone, Elena has come back to share with you one more tutorial on drawing the flowers using Faber Catell Design Memory Craft® stuff. Art GRIP® Aquarelle Watercolor Pencils, Paper Crafter Crayons™ and Gelatos® - they can be easily mixed as they match each one perfectly. The winner of Freebie Friday is Lesley Delamorandiere! I love to use tissue/wrapping paper and Gesso to make textured background. And finally...any words to our readers? Enjoy crafting and have fun! Hello, everyone, Meihsia here with a fun and colorful project for summer using Gelatos®, Stamper's Big Brush Pens and Paper Craft Crayon™. I have taken many photos of kids at their summer activities and I am going to use this frame for one of those photos. This frame is also a beautiful wall decor for kids room without picture on it. Our featured designer today is Lisa Adametz! I'd love to go to New Zealand and Italy. New Zealand just because it's so beautiful and Italy because of the art history. Spicy food! Mexican, Thai...that kind of thing. Nothing weird. I would call it feminine artsy. I love ALL kinds of techniques and embrace layers. Don't ever be afraid to try something new or something out of your comfort zone. It's at times like these that you may find something that brings you the most joy. Hi! It’s Lisa here and I’m so super thrilled to be up on the blog today. I love finding new things to do with my Faber-Castell Design Memory Craft products. I started playing around (I know…again!!) with my Gelatos® and I wanted to try to do something new. Now, a background may not seem like a “new” idea, but it’s really HOW you create it. I really feel like all the colors in the Gelato® family could be used so beautifully for a background like this. There's nothing like starting your Friday on a sweet note. It's Freebie Friday! One lucky winner will win 2 sets of the Stamper's Big Brush Pens, PITT Artist Pens, and Gelatos! To enter, just leave a comment below on how you plan to use this prize. The winner will be announced on Monday, 6/24. *This giveaway is open to US and international residents. Hello everyone! Heidi here today with another Guest Designer post. One of my favorite ways to add texture to a project is using Gesso. I have a tutorial to share with you showing how I tinted the Gesso using Gelatos® for a perfect color match to my project and added texture.